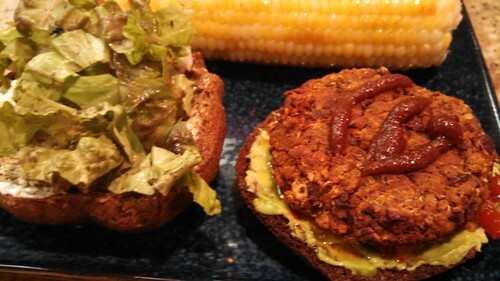 This week’s Burger Experiment comes to us from Lindsay S. Nixon‘s cookbook, Everyday Happy Herbivore cookbook. I have decided that in the Great Gluten-Free Burger Experiment I’m going to try substituting instant oats (GF, of course) any time I see Vital Wheat Gluten called for in a recipe. I also sub Tamari for anytime soy sauce is called for. We’d already tried the recipe for the Pinto Burgers (same cookbook, page 86), which is already gluten-free, and loved them. In fact, they inspired my Summer Cilantro Slaw recipe! However, I wanted to try a new recipe and since this book has several bean-burger recipes to try I went for the Kidney-Qunioa Burgers (page 85) merely because I like kidney beans a lot. First of all, this recipe comes together so quickly it is great. These could be whipped up from scratch on a weeknight. They were very flavorful, even though I totally forgot the tablespoon of Italian Seasoning it called for. The instant, GF oats worked perfectly, especially since I gave the “dough” about 10-15 minutes to rest and let the oats get sticky. 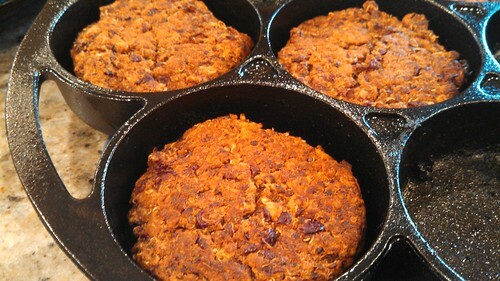 Last week, after the Scarborough Fair Burger Experiment, Christie had the idea of trying out our English muffin cast-iron pan for cooking the burgers. It would heat them more evenly and it would keep them in a nice, uniform burger shape (one which perfectly squishes out to fill an average bun). I heated the pan up in the oven while it preheated and sprayed lightly with oil before putting burger patties into each mini-pan. I must say, this idea is a winner and I will be using it for all burgers despite what cooking directions suggest. Also known as a Drop Biscuit Pan , this works perfectly for English Muffins and scones too. Oh, and clearly vegan burgers as well! Once again, the Wild Buns from Happy Campers Gluten-Free were the bun of choice. I loaded mine up with grainy mustard, vegan mayo, avocado, red pepper relish, a little ketchup, and some salad greens. It was pretty awesome (blurry, impatient photo indicates my rush to eat this all up). On the reheat in the morning these, similarly to the Pinto Burgers, were a little dry. One patty is frozen to see how it does with the thaw/reheat test. One possible idea for these might be to par-bake them to help to retain the shape, freeze, and then reheat in a cast iron skillet.